This looks like an interesting way to get out and spread the word about yourself and your work. We have not been, but it appears to be open to any type of artist. If anyone goes, please let us know how it is. Happenings are alive and kicking in the Grove, at the Arts and Minds Center. WHO: AMJAM started out as a â€œJam Sessionâ€ for musicians as part of the educational program at the Academy of Arts & Minds High School, located at the Center, with as a collaboration between music instructors and student artists. WHAT: It quickly morphed into a â€œHappening,â€ involving multiple art forms, a forum for expression where students, teachers and other talented people from through out the City can â€œshow their stuff.â€ The result is an evening that can include vocal or instrumental music, dance, comedy, drama and visual art performances, turning the A&M terrace into a creative extravaganza. Everyone â€“ student or professional, is invited and encouraged to join the jam. It is great way to forge artistic alliances among enthusiasts and colleagues alike. 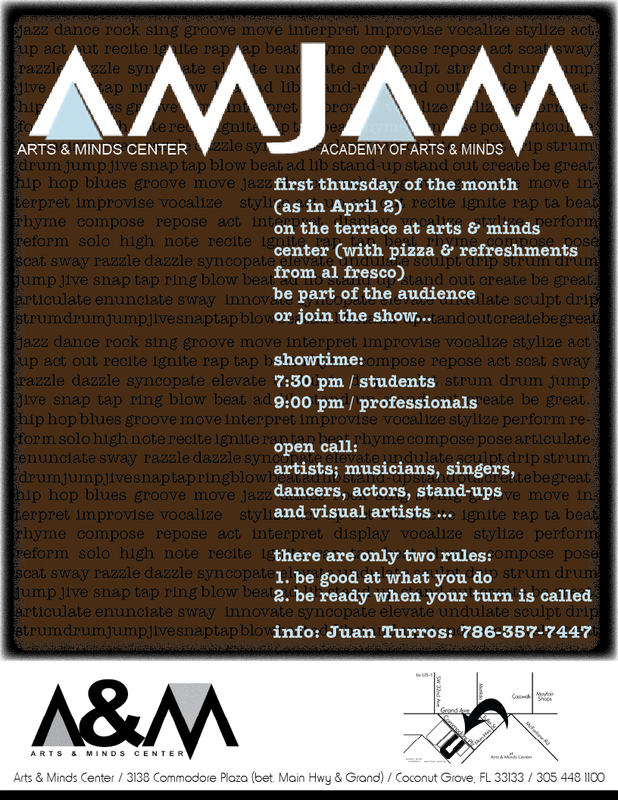 WHEN: Arts & Minds Center holds the AMJAM every first Thursday of the month. The next AMJAM takes place Thursday, April 2, 2009. Starting time for student artists is 7:30 pm. For instructors and professionals 9:00 pm. DETAILS: All artists; musicians, singers, dancers, dramatic and comedy stand-ups and visual artists are invited to participate. 2. You have to be ready when your turn is called.